Every year for the past several years, NAME OF THE WIND and THE WISE MAN’S FEAR author (and good buddy of mine) Patrick Rothfuss has run a charity drive where he matches at 50% donations to Heifer International through his Worldbuilders team page. Everyone who enters the general drawing gets a chance at a huge number of prizes. There are also individual auctions on several of the most desirable items. Pat explains it best. I’ve donated various books to the prize pool before, and this year I and Badali Jewelry have teamed up to donate a special Wheel of Time package to the auctions. My contribution is from among my personal leatherbound copies of THE GATHERING STORM and TOWERS OF MIDNIGHT. With each Wheel of Time book that is released, Tor puts out a limited edition of 126 signed copies, 100 of them numbered for commercial release, and 26 of them lettered for publisher and author use. I received copies B and S of both books, and I’m donating the matched set of S copies. Please see Pat’s description below. The auction itself is here, and you can see the other auction items here. And remember, for every 10 dollars you donate on the Worldbuilders Team Page, you get a chance to win a book from the general prize pool. 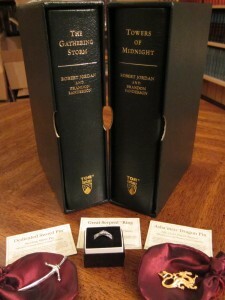 These gorgeous gold-lettered books are leather-bound and designated “S” out of 26 lettered copies. The books come in their own matching leather slipcase, feature a facsimile of Robert Jordan’s signature, and are signed by Brandon Sanderson. In addition to these stunning best-selling books, this auction includes three lovely pieces of jewelry inspired by Jordan’s series: an Asha’man Dragon Pin, a Dedicated Sword Pin, and a Great Serpent Ring.